WoPC Home > U.S.A. > Perfection Playing Card Co. 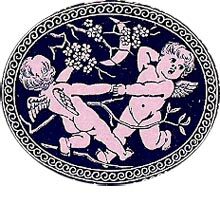 The Perfection Playing Card Company operated from New York and Philadelphia since c.1885. Mostly they produced standard cards but with a number of special Aces of Spades and Jokers which were interchanged between the different brands. Brand names were distinguished on the box and include: Roosters, Favorites, Tip-Top, Champion, Specials, Steamboats, Aurora, Coronet, etc. They also published a Geographical Euchre in 1886 giving statistics concerning all of the States and Territories. 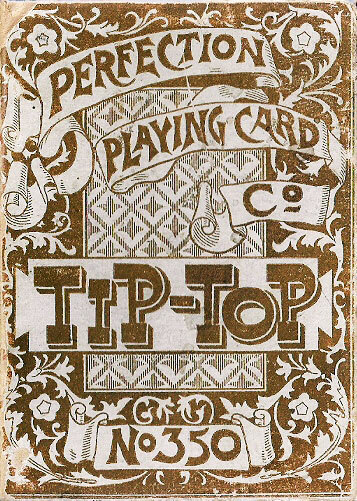 The Perfection Playing Card Company was finally absorbed by U.S.P.C.C. in 1894, but the name continued to be used until c.1915. ← Left: brand names were distinguished on the box as the Ace of Spades was generic. Above & Left: Tip-Top No.350 playing cards manufactured by Perfection Playing Card Company, Philadelphia, c.1887. 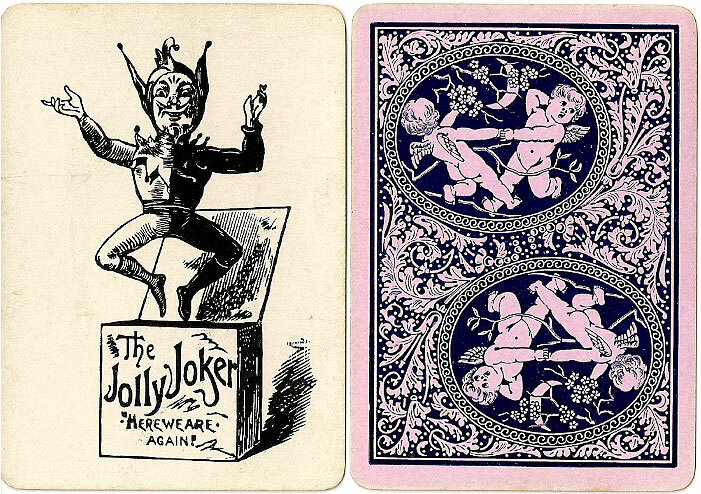 Over the years, the company issued several different Aces of Spades and Jokers which were interchanged in different brands. The Jolly Joker springs out of a box with the inscription "Here we are again". (Click image to zoom). Cards from the collection of Rod Starling.